I posted this blog entry last night to show my support to Megan Young being Philippines' candidate to the Miss World amid the disqualification news that spread online. Honestly, I didn't watch the pageant myself. I was too tired from my daughter's party today so I laid my aching back in bed, closed my eyes imagining wall fountains at soothing walls, confident enough that she'll take home the crown. I woke up just a few minuted ago, turned on the computer, visited Miss World's FB page and learned that she won. Ha.. I knew it! The final three.. Miss Philippines Megan Young as Miss World 2013 Winner, Miss France Marine Lorphelin as the 1st Runner Up, and Miss Ghana Naa Okailey Shooter as 2nd Runner Up. Congratulations Megan Young for winning the country's Miss World crown ever! With your talent, beauty and poise, I believe you'll make it on top. You just made all Filipinos proud and you proved the world once again that Philippines is a country with women of beauty and brains. For this year, we got Miss Supranational and now we won Miss World too. Hooray Filipinos! Today is my elder daughter's McDonald party. If you saw my post on our simple home party the other day, that was only the first part of her birthday celebration. Hubby and I promised her a Disney Princess themed party so this is it. In preparation, we booked a McDonald party, ordered a cake with Disney Princess design at Sophie's Mom, bought some goodies for the loot bags and took her to a dressmaker for a princess dress. She isn't feeling very well, got a little cough, and it might be rainy but I hope everything will turn out right. 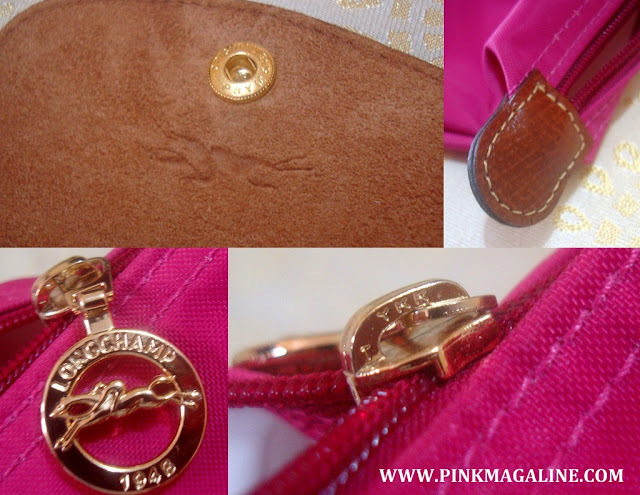 Question From a Reader: How do I know I'm buying a genuine Longchamp Le Pliage tote bag? I received a couple of emails from readers last month. The first email was about working visa application to Turkey. The second one was about buying a Longchamp bag. I couldn't answer the first letter well because of limited knowledge so no post about that here. Instead, I am posting the latter which I think I can answer better and here it goes. Hello sis. I read your post about your new Longchamp Le Pliage tote. May tanong ako (I have a question). How do I know if I'm buying a genuine Longchamp Le Pliage tote bag? Marami sa IG at FB ang nagbebenta ng Longchamp. Paano ko ba malalaman na hindi fake ang bibenta nila? Staka pag made in China ba fake? Pakisagot naman sis 'cos I really want to buy an LC, takot lang ako na fake makuha ko (A lot of people sell Longchamp in Instagram and Facebook. How will I know they're not selling fake bags? And is it fake if it's made in China? Please answer sis 'cos I really want to buy an LC, but afraid to get a fake one). Salamat (Thanks). Well dear, I was exactly on the same boat before and was very close to buying a Longchamp tote from a certain supplier in Facebook. Glad that I asked for the help of an expert before making a decision. Turned out that the bag I was supposed to buy was a knock off. Anyhoo, this is my pink Longchamp Le Pliage shopping tote with long handle in small size. An authenic Longchamp Le Pliage tote like this is around P7,000 but I got mine a little less than P5,000 on a sale at Rustan's Gateway Mall in Cubao. The dimension of this bag is 14″ x 10″ x 10″ with a 7 1/2″ handle drop. So, before you buy a Longchamp tote from any supplier online, be it Facebook or IG, make sure you check www.longchamp.com for the exact dimension of the Le Pliage bags you are buying. Now let's go down to the details of the bag. Please refer to the collage of close up photos above. Notice that the handle is made of Russian leather, the inner pocket is perfectly placed and the brand name is embossed on the flap as well as the words LE PLIAGE "SHOPPING" – MODELE DEPOSE. I've read from other threads though that older versions of Le Pliage have different words with them. More details to spot here. The jockey is visible at the back of the flap cover. 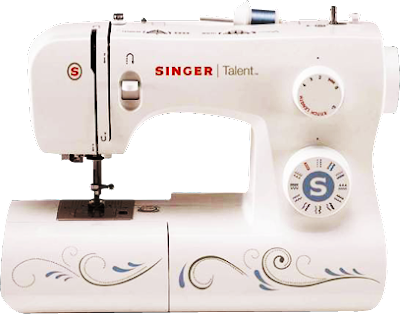 The quality of stitching is very good. 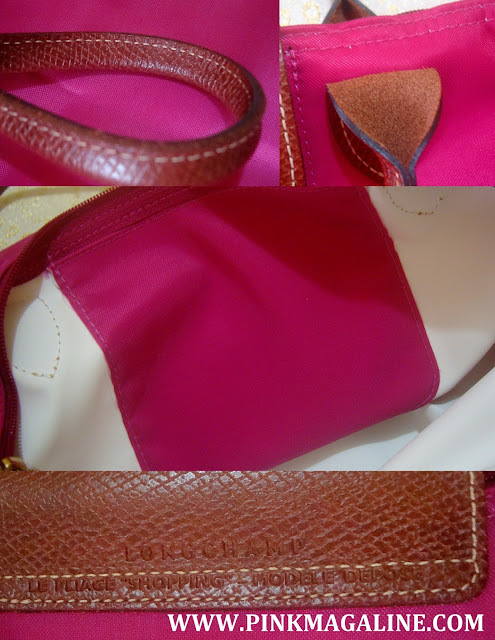 Pink for the nylon material and white for the leather material. The metal logo on the zipper is perfect and the "YKK" and a "T" sign is very clear. The inside of a Le Pliage is white. The tag says made in France and it has the style number too. That's 2605 089 560, the same style number indicated in the card that comes along with it. By the way, Rustan's sells both made in China and made in France Longchamp bags so when you say made in China, it doesn't automatically mean it's fake. I think you'll know a seller is selling fake bags if her price is way too low compared with legitimate online shops like Nordstrom, Neiman Marcus and the like. Better yet, visit one of the Longchamp stores in the metro and check their bags yourself. Study the one you wish to buy carefully and take note of the details that I just pointed out. 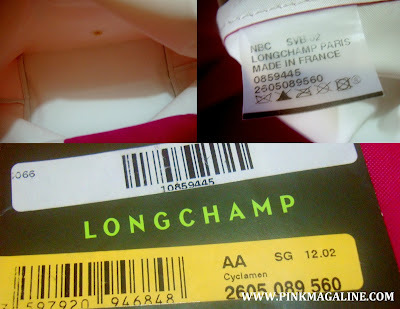 For the list of stores where you can buy Longchamp in the Philippines, check the list below. That would be all. Thank you for your email. I hope I'll be able to help you with this post. PS. Email me again if you have a follow up question. 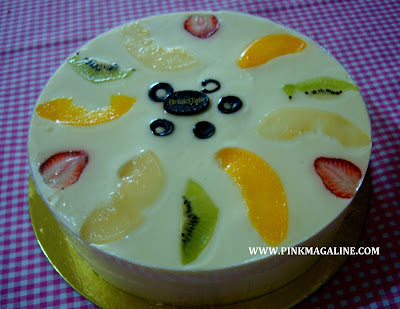 A simple birthday celebration was held at home yesterday for my elder daughter. 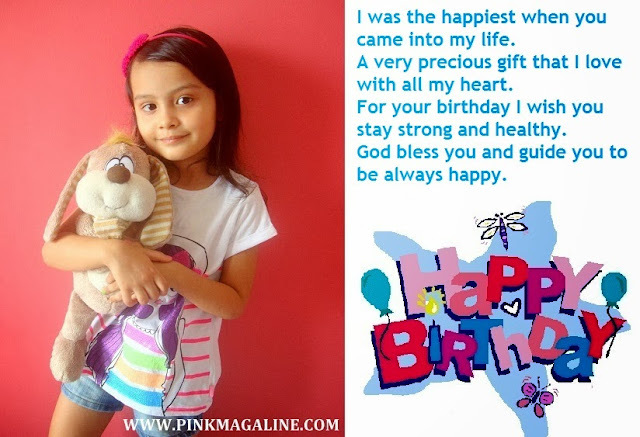 She is now 5 years old. I cooked her favorite spaghetti, then there was also pancit canton, chicken and beef adobo, shanghai rolls and corn maja. 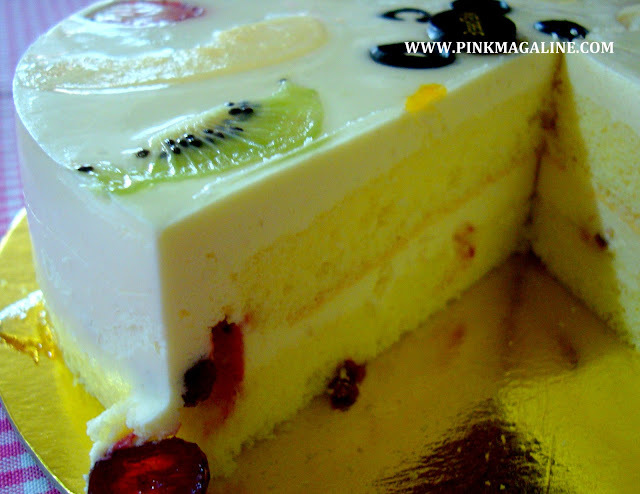 I sent a cousin to buy a small greeting cake at Red Ribbon. 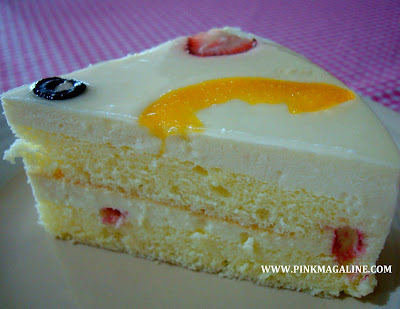 She bought an extra leche flan cake roll, so we had 2 cakes altogether. Happiness was very visible on the face of my panganay (firstborn). She's a little jealous of her little sister these days but yesterday was special. I know she knows we love her as much as we love her sister. When asked to make a wish before blowing the candle, she said "I love you Suna!" So sweet ate. I hope they'll get along really well. PS. We had a Disney Princess themed party for our elder daughter 3 days after this party. Click HERE for my photo story. I was the happiest when you came into my life. A very precious gift that I love with all my heart. For your birthday I wish you stay strong and healthy. God bless you and guide you to be always happy. Happy birthday Aşkim! Mama loves you so much!! I am so in love right now. I think I found the perfect pair of boots for me. I actually haven't seen it in person yet but I am sure I'm gonna be using it like forever once I got it in my shoe closet. You know hubby almost bought a studded Zara boots for me last summer in Istanbul. Glad that I said no because it wasn't really my style. 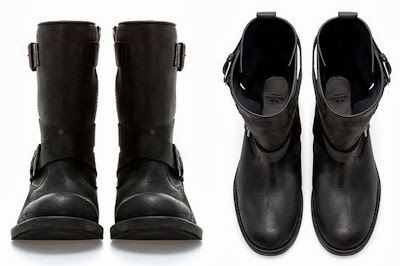 Look, I saw these mid-cut boots at Zara's while I was checking sites in random last night. Genuine leather. Biker or motorcycle style. What a beauty! 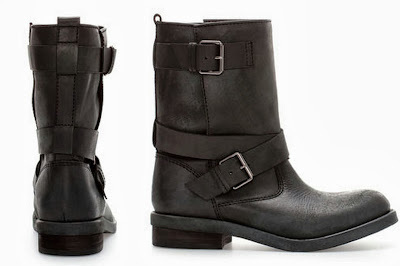 This kind of boots is great to wear with jeans and shorts. It is also perfect with short dresses. My favorite celebrity in biker boots is Agyness Deyn. She reminds me of my tomboyish days. Alright whatever.. enough about blabbing so much. I just really, really want this pair for Christmas. Santa please? Our family trip to Hongkong back in 2011 was short but very memorable. Hubby and I took our then only daughter, now big sister, to Disneyland and then went to Mong Kok for the night market, Tsim Sha Tsui for the Symphony of Lights, Wong Tai Sin Temple, Central, The Peak, and Madame Tussaud's Museum. We could've visited other tourist spots other than those I mentioned but we just flew in for the weekend. Plus, our elder daughter was only 2 years old that time so touring was a bit of a challenge. Anyhow, hubby and I agreed to have our next trip abroad next year. If we can't go to South Korea to see snow and visit Everland, then we'll most probably end up visiting either Singapore or Hongkong. In my case, I really want it to be Hongkong again because I already learned to love that place. I used to worked there and I still have friends and relatives there. I swear bringing my family to Hongkong for another Disneyland tour and shopping around Causeway Bay is what I'm dreaming of right now. 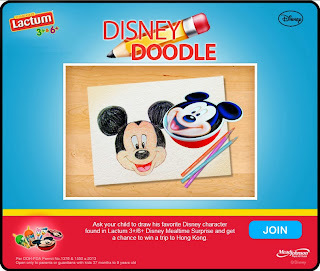 By the way, if you love Hongkong too and would want to visit that place soon, you might want to enter the Lactum 3+/6+’s Disney Doodle promo and get a chance to win a trip to Hongkong with your family. Follow these steps to join. Step 1. Ask your son/ daughter to draw his/her favorite Disney character from Lactum 3+/6+ Disney Mealtime Surprise. Step 2. 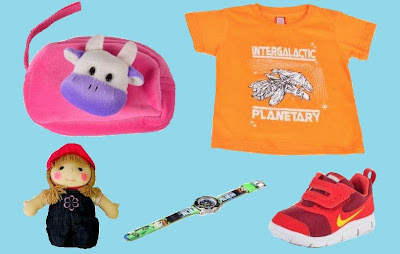 Snap a photo of your child’s work together with Lactum 3+/6+ Disney Mealtime Surprise. 3. Upload the photo of your child’s artwork as your entry. Take note that Lactum 3+/6+’s Disney Doodle promo is open to all mommies and daddies with kids aged 37 months to 9 years old alone. Submission of entries is open until October 15, 2013 only. Voting will start on October 16, 2013 until October 31, 2013. What are you waiting for? Make your dream vacation come true by asking your kid to start doodling now! Our first daughter had a 3D 4D ultrasound when she was still in my tummy, so hubby and I got an idea on how she would look like before birth. With our second baby, the sonologist at In My Womb had a hard time capturing a 3D 4D image of her 'cos I was already 8 months pregnant during scan. 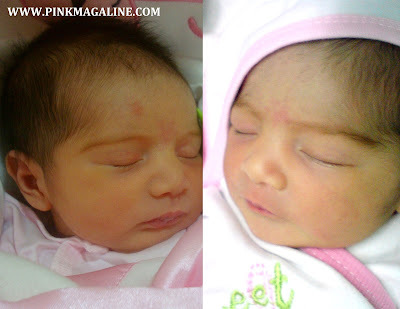 Anyway, I remember hubby telling me that he saw our baby in a dream and she looked exactly like our elder daughter. I said okay, let's see after delivery. Fastforward to the present, a lot of people noticed that they really look alike during infancy. It's quiet a challenge to distinguish one with the other in photos. Which one is Askim? Which one is Suna? My daughters are like Ctrl+ C, Ctrl+ V! We see more identical features of our bunso to her ate everyday. The eyes, eyebrows, lips, and nose. They look like twins separated from birth. The first one came out 5 years ago, while the other one came out later this August 8, 2013. Of course we know this is common. Siblings have a huge chance to look alike simply because they came from the same mother and father. For hubby and I, we are just happy to see such an amazing thing happening in our family. We are blessed to have such wonderful daughters and grateful that they are healthy. Thanks God! One of the common problems of women after pregnancy is the post-partum pooch. I know how hard it is to get rid of that extra tummy flab, so this time again I made sure to wear a maternity binder. A week after delivery, I shifted to a waist-shaper and saw the difference in my waistline. 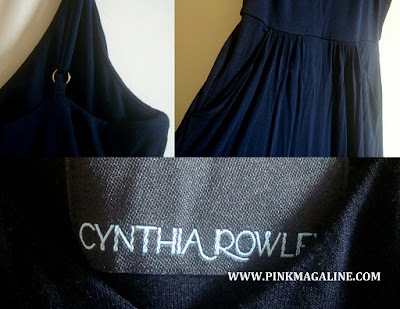 On the third and fourth week I mostly wore this waistline reducer. Sogo Waistline Reducer is for men and women. 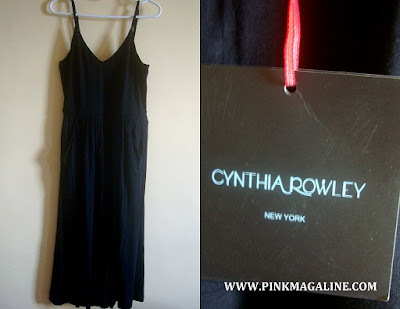 It sells at P399.75 in department stores. It has extra strong elastic waistband with velcro fastener. I got mine in beige color but this product is also available in black. The packaging says it helps maintain your waistline, specially helpful for women after giving birth and men with protruding "beer belly", so easy to use, and feels like you're not wearing any at all! Sogo Waistline Reducer is available size small for people with 22 to 29 inches waistline, medium for those with 28 to 35 inches waistline, large for 33 to 41, and extra large for 42 to 49. -It is strong and elastic. -Not too thick and it doesn't feel hot when worn. -I had to cut the velcro edges because they were painful to the skin. -The velcro produces a loud noise while unfastening. -Too strong so fastening it is not easy. It helped me reduce my waistline so I guess yes. My waistline was 38" after delivery. Now I am down to 30". I will continue using it until I reached my desired size. In the fashion world, September is the most-awaited month because it's the month wherein designers and brands showcase their latest collections. It involves a series of catwalk events called fashion week in cities such as London, Milan, New York and Paris. Here in the Philippines, the most-awaited September event for stars and showbiz personalities is called the Star Magic Ball. This year, a lot of celebrities graced the red carpet and elegantly mesmerized the crowd. Bea Alonzo in a sparkling Ezra gown. Like a real princess is Julia Barretto in a gown by The Impalpable, Michael Cinco. Maja Salvador in a lacey gown with a mermaid silhouette by Cary Santiago. Jessy Mendiola in a black Francis Libiran gown. Erich Gonzales in another sparkling Ezra gown. These ladies remind me of my plan to continue dieting and exercising in order to go back to my old size. I mean really, I envy those curves. I already lost a considerable amount of weight after giving birth over a month ago but still need to shed a few pounds. Honestly, I don't feel like shopping yet even I get tempted to shop from time to time. Still trying to hold my patience, trying hard not to add anything in my wardrobe yet until I completely went back to my pre-pregnancy weight. Congratulations Mutya Johanna Datul for winning the Miss Supranational 2013! The Isabela native took home the crown after competing with other candidates from over 80 countries around the globe in Belarus on September 6. Mutya Datul is one of the winners of the Golden Batch of this year's Bb. Pilipinas. She has it all.. natural Filipina beauty with that perfect smile, brains and a stunning personality. Mutya Johanna Datul surrounded by her fellow beauty queens after the coronation. With her fellow winners, 1st Runner Up Miss Supranational 2013 Mexico, Jacqueline Morales and 2nd Runner Up Miss Supranational 2013 Turkey, Leyla Kose. Not in the photo are 3rd Runner Up Miss Supranational 2013 Indonesia, Cok Krisnanda and 4th Runner Up Miss Supranational 2013 US Virgin Islands, Esonica Veira. 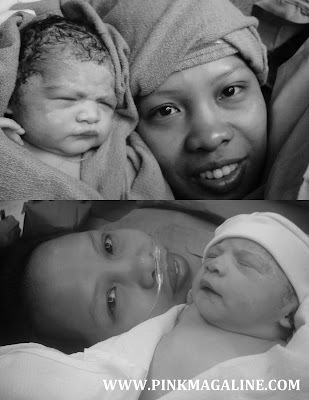 With our second baby, hubby and I only thought about giving birth at either St. Luke's Global City or Makati Medical Center. Although St. Luke's is nearer our place and there is less traffic going there, after the compare and contrast sessions, the final decision was to give birth at Makati Med. Anyway, I delivered our first baby girl via C-section at Makati Med so I'm already at ease in there. Also, it is good to think that both girls have the same birth place. 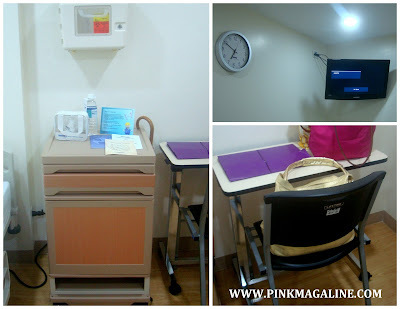 For mommies out there who are planning to give birth at Makati Med and wondering how a semi-private room looks like, this post is for you. You know, I was confined at Makati Med for a cyst removal back in 2008 and stayed in a semi-private room for a couple of nights. Back then, their room wasn't as good as this. They did some renovation and the rooms are now improved, as well as the interior and exterior looks of the hospital. A semi-private room is around 11 square meters in measurement. Inside is a patient's bed with reclining feature, wheels and all, side table, chair, small cabinet, and a cable-ready TV set. The semi-private room where I stayed back in 2008 had a long john. This one has a high-back chair with footrest for the use of the patient's helper or companion. The common toilet and bathroom is clean with bathroom tissue and sanitizer. Three patients share the use of this room. I don't have a floor plan of the area but imagine a large room with four doors. One of the doors is leading to your room, the two other doors lead to other patient's room and the last door is to the washroom. By the way, I chose a semi-private room in order to save money. An elective cesarean delivery maternity package with a semi-private room is P82,000. That's a stagerring P145,200 if I have chosen a private room. So, why not say YES for over 60K worth of savings, right? You can reserve a room at Makati Med if you are having a scheduled surgery like me. Some rooms have window and a view of the city. For more information, just contact the MMC Admissions Office at +632.8888.999 local 3000, 3001.